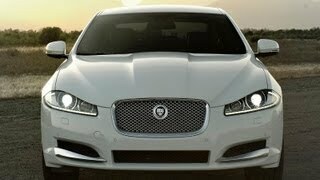 The all-new Jaguar XFR 2012 gets a facelift with the new sheetmetal grille, bonnet and front wings to give the car a more muscular, purposeful appearance. 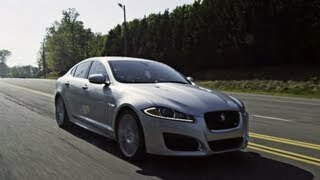 A saloon with the soul of a Jaguar sports car, the XF has won accolades and enthusiastic fans across the globe for its dynamic abilities and dramatic looks. 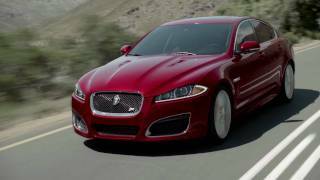 Advances in lighting technology have allowed the new 2012 Jaguar XF model range to adopt the bold Jaguar design language introduced on the flagship XJ saloon. Sheetmetal revisions to the grille, bonnet and front wings incorporating new triangular side vents give the car a more muscular, purposeful appearance. 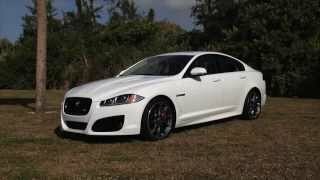 The range-topping Jaguar XFR receives its own unique, overtly assertive design to underline its performance potential while an alternative 'Aerodynamic' option is available on all other derivatives for a total of three dramatically different styling options. The headlamps now incorporate bi-function HID xenon technology that allows them to be much slimmer and more compact while still providing outstanding beam resolution. They also incorporate LED daytime running lights arranged in a distinctive Jaguar 'J-Blade' signature pattern for instant recognition. The tail lamps have been entirely renewed and now extend onto the central portion of the boot lid. These new units are now full-LED for stop, light and indicator functions and give the Jaguar XF a distinctive night-time rear signature. Separating them is a revised boot lid finisher with a gloss black lower edge for a cleaner appearance. The boot also features power closure on all models. 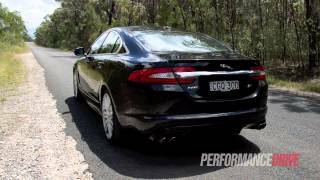 Key among the enhancements to Jaguar XF is the introduction of the 2.2-litre AJ-i4D turbodiesel engine. The unit features low-friction pistons and a water-cooled turbocharger to increase efficiency plus active engine mounts and modifications to the sump and block to reduce NVH levels. The result is not only Jaguar's most fuel-efficient engine ever, but one which offers levels of refinement on a par with the previously-fitted 2.7-litre V6 diesel and all the performance expected of a Jaguar sports saloon. Further refinement is assured on all models by the use of additional acoustic shielding and the use of computational fluid dynamics to smooth exterior airflow. Power output is 190PS with an impressive torque figure of 450Nm to provide the muscular performance expected of a Jaguar. Reaching 60mph in 8.0 seconds, the car will go on to achieve a top speed of 140mph. Nevertheless the unit still manages 52.3mpg on the EU combined cycle - making it the most economical Jaguar ever - and emits just 149g/km of CO2 and is Euro Stage V compliant. The engine is perfectly complemented by the all-new 8-speed ZF automatic gearbox. Specifically adapted by our engineers for its first-time application in a Jaguar, the transmission offers a host of benefits including both improved acceleration and economy. Gearchanges are completed in just 200 milliseconds - four times faster than the average human resting heartbeat - while driver control is enhanced by the ability to perform multiple downshifts using the paddleshift technology. The use of lightweight materials ensures the overall weight remains the same as the previous six-speed transmission, while improved pump design and gear control elements increase efficiency. Standard on all Jaguar XF diesel models, it reduces the CO2 emissions of the 3.0-litre V6 to 169g/km and improves fuel consumption to 44.8mpg. Also making its debut with the 2.2-litre diesel engine is Jaguar's new Intelligent Stop/Start system, the first time this technology has been seen in a premium diesel saloon. This automatically shuts down the engine in just 300 milliseconds when the car comes to rest, in order to improve fuel economy and CO2 emissions by between five and seven percent. No driver intervention is necessary, with the engine management software analysing a host of complex factors in order to decide when the engine can safely be stopped. A Tandem Solenoid Starter with a dedicated secondary battery instantly restarts the engine as soon as the driver's foot leaves the brake pedal, ensuring it is running optimally by the time the accelerator is pressed. In order to facilitate this process, the gearbox features Hydraulic Impulse Storage, which supplies oil pressure to actuate the shift elements. For the first time, all diesel variants are also available with Jaguar's Adaptive Dynamics system, allowing the enthusiastic driver to enjoy the car's outstanding chassis control and discover the Jaguar XF's sporting soul. Whether experienced from the driver or passenger seat, the cabin of the Jaguar XF is a uniquely welcoming and stylish place in which to spend time, using high-end materials in a truly contemporary manner. Continuing to feature such dramatic 'surprise and delight' elements as the Jaguar Drive Selector that rises from the centre console and air vents that rotate to their open position when the starter button is pressed, the Jaguar XF interior has also received a comprehensive update. Revised front and rear seats incorporate a 'hoop' feature on both squab and backrest that improves not only their appearance but also the support it offers by increasing the seat's profile. New hide colour combinations, veneers and headlining choices increase the personalisation options available to buyers. All models benefit from a revision to the colour scheme on the centre console, fascia and steering wheel where the 'Tungsten' finish is replaced by a more contemporary 'Aurora' theme. The Jaguar XF incorporates a formidable amount of technology but in true Jaguar fashion it is integrated seamlessly into the function of the car and controlled through a central seven-inch Touch-screen with a new polarising filter for better contrast viewing. In order to reduce driver workload, additional switches have been added below the Touch-screen to instantly switch between different functions while new graphics are based on those in Jaguar's flagship XJ. The main driver instrument cluster is now a full-colour TFT unit for greater resolution and clarity. Three new audio systems are offered on the Jaguar XF, all of which represent a significant upgrade on those previously available. Heading this up is a 1200W, 17-speaker premium set-up, from British audio experts Bowers & Wilkins, which offers concert hall-like sound reproduction. All audio systems can be specified with a hard-drive based satellite navigation system that incorporates a 'virtual' CD multichanger allowing the owner to 'rip' 10 CDs at a time into the car's memory storage and play them as if they were a physical music medium. The system also now offers a number of different options for connecting MP3 players; two USB ports, one of which is iPod specific and Bluetooth connectivity that allows music to be streamed from a smartphone. The majority of the car's functions can also be controlled from the driver's seat by Jaguar's Interactive Voice functionality, which provides an intuitive interface for safe, hands-free operation.